Hello Loves. I recently won a gift card to Bio Seaweed Gel through one of their Instagram contests. I was beyond thrilled since this is a brand I have been curious about for quite some time but haven't ordered because shipping is a bit high from Canada to the U.S. Bio Seaweed Gel is 5-Free and has two lines of Soak Off Gel Polish - the Unity All-in-One Colour Gel Polish and the 3-Step Colour Gel Polish. I'm going to focus mainly on the Unity line in this review, but I did get one of the 3-Step colors and have a swatch to show you of that one too. Let's start with some swatches and finish with the review. The first color I have to show you from the Unity line is Bombshell (#221). Bombshell is a gorgeous magenta cream that is fully opaque in two coats. The next color I have to show you is a bright, almost neon coral cream called Babe (#106). I ordered this one expecting it to be much softer based on photos online, but one I received it I immediately knew why the photos I saw were not accurate. Babe is bright! So bright that it freaked out my camera. It immediately reminded me of my current photography nemesis - Gelaze Flip Flop Fantasy. It is a fabulous color for summer and my photo does not do it justice. I found that this one needed three coats for full, even coverage. Finally, this silver glitter beauty is called Diamond VIP (#233). The base is a super fine silver glitter that has slightly larger, mixed glitter pieces scattered throughout. Application on this one was pretty standard for glitter polishes. I found that floating the brush over the nail in three even strokes was key for solid coverage. Depending on your application, it is opaque in two to three coats. I needed three to cover a few bald spots from letting the brush drag. The larger glitter pieces are much easier to see in person than they are in the swatch above. I took a slightly blurred closeup in an attempt to show them a little better, but the extreme reflections from the silver base freaked out my camera a tad. You can see them best in the bottom half of the photo below. The Unity gel is a bit thicker than most of the gels in my collection and has a true gel consistency. I took a picture of the brush as it is pulled out of the bottle to show you the thickness of the gel. The colored gel on the black background of my light box freaked out my camera, so I took this one in black and white to calm things down a bit. I was surprised by this when I opened the bottle, but it applies smoothly and evenly. I can't even think of how to describe it, honestly, but application was effortless. The thicker consistency glides over the nail without dragging. No fighting, no pooling, absolutely NO shrinking (that's one claim confirmed), and it self levels beautifully! I even tested the "Never Wrinkles" claim by applying a crazy thick layer to a swatch stick. One thing I know about soak off gel is that thick layers are a recipe for wrinkling. This one didn't wrinkle even with a super thick layer (note that thick layers are not recommended - this was just a test). Application couldn't be easier. Prep the nail by removing all oils from the nail plate. Allow the gel to cool/set for 3-5 minutes before touching it (according to their website, skipping this step will result in a dulled shine) There is NO tacky layer to remove! Enjoy your lasting gel manicure. So, is it REALLY that simple? Yep. It really is that simple. I have been wearing Bombshell on my toes for the past two weeks without a base or top (I'll spare you the photos of my feet - you can thank me later). It has worn flawlessly so far. The only negative I can find is that it doesn't cover ridges as well as it would with a base and top. My toe nails don't have that perfectly smooth look I usually get from gel pedicures. 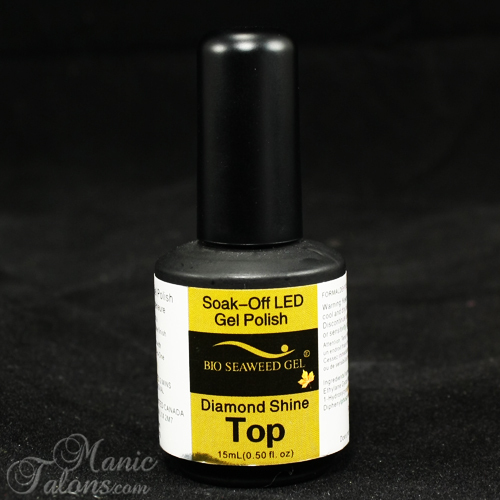 If you have ever tried a gel that doesn't require a top coat, you're probably wondering about the shine. On a scale of 1-5, I would give the Unity Gel (without additional top coat) a 3. It does shine, but it does not have that mirror finish you would get with a separate top coat. I also found that the shine dulls out a bit after a few days of wear. In the photo below, the first swatch is without an additional top coat and the second swatch has Bio Seaweed Gel Diamond Shine top coat. See how the reflection on the left is fuzzier than the one on the right? That's what I mean by dull. So, how does it wear? As I mentioned above, my Unity Gel pedicure without base or top has worn chip free for two weeks with the only complaint being a slightly dull finish compared to gel pedicures with a top coat. But we all know that even regular polish lasts much longer on toes than it does on fingers. So I put these gels to the ultimate test. For the past two weeks, I have been wearing Bombshell on my right hand with an accent nail of Diamond VIP. For the right hand test, I also wore the No Sanding Base and Diamond Shine Top Gel. I completely spaced out and forgot to take before photos, but here is what it looked like after two weeks of wear on my dominant hand. It's also worth pointing out that I abuse this hand like crazy. If a gel is going to chip, the nails on my right hand are the ones to chip first. Other than a bit of growth and some nicotine stains, the manicure is FLAWLESS. 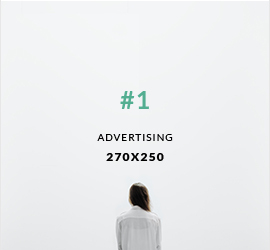 Sorry to scream, but that's pretty impressive. No tip wear even! This is practically unheard of for my nails. Let me stop for a second to talk about the No Sanding Base Gel. This is exactly what the name says - a base gel that does NOT require buffing of the nail prior to application. You apply it directly to the natural nail after cleaning to remove oils. No roughing up the nail plate, no risk of thinning nails over time, no hassle. I also found the gel is thinner than many base gels, but I had no problems with pooling or shrinking. Hallelujah! This might be my new favorite base. Back to the wear test...I didn't stop there. After confirming that the Unity Gel can be worn without a base or top for manicures (not just pedicures - I was unclear on this from their website as it states that the base and top are available for a complete salon manicure), I decided to test that too. So I have worn the same manicure on my left hand for the past week, but without the No Sanding Base Gel. I originally planned to skip the Diamond Shine Top Gel as well, but after applying two coats of the Unity Gel, my nails didn't feel as strong as I like. I could push downward on the tip and feel them flex. While I would love to be able to give a thorough review, I'm a few swatches away from finishing a major swatching project for another brand and couldn't risk a break. So I added a layer of Diamond Shine Top Gel. That did the trick by providing the strength I needed. Once I finish the swatching project, I'll revisit the Unity Gel and see how it holds up on it's own without the top coat. Ok, so back to the wear results without the No Sanding Base Gel (for real this time). Remember, this was a one week test. I considered giving it two weeks, but to be completely honest, it almost killed me to wear the same manicure for two weeks! I needed a change! Once again, the wear is nearly flawless. I did have a small amount of tip wear on my pinkie nail, but that's pretty common with the amount of typing that I do. I almost always have wear on the outside corner of that nail from where it rubs against the keys. You may notice that the color looks different between these last two pictures and the swatch I showed above. That's because they are slightly different. This particular color (Bombshell) loses a bit of the bright purple tone over time. It gets slightly darker. This last photo (the wear test without base) is the best representation of the color change. The photo from the two week test is NOT color accurate due to nicotine stains. Yes, I know, it's a horrible habit that wrecks my manicures. I usually wear a regular polish top coat that I change every few days to lessen the effect of the staining, but I didn't want to alter the wear test by removing the regular polish. Thus the stains. I have to admit, when a gel wears flawlessly for two weeks, I get really nervous about removal. When they stick, it typically means they're going to be hard to remove. 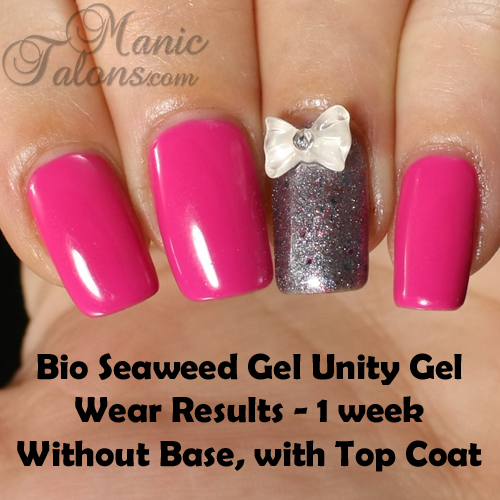 Yet Bio Seaweed Gel claims that the Unity All-in-One gel soaks off in less than 10 minutes and the bottle of No Sanding Base says it removes in 5 minutes (I assume that applies only to the base). The Top gel also says "5 Minute Soak Off Removal". When it came time to remove the 2 week mani, I broke the seal on the top coat by buffing the nail with a fine grit file. I then used the foil wrap method with pure acetone and waited 10 minutes. When I checked the nail, it looked strange. Let me explain - because the Unity Gel has no tacky layer, the coats don't seem to bond together like a traditional soak off gel. So they appear to break down in layers instead of flaking off in one piece. The first image (1) in the collage below shows what the gel looked like when I remove the wrap. Strange, right? The second image (2) is what it looked like after I gently pushed the gel with the thumb nail on my opposite hand. See how it kind of breaks off in small pieces? I did not scrape the nail plate or force the gel off. I gently ran my thumb nail over the surface of the gel. At this point, I decided it had not broken down enough to remove after 10 minutes. I reapplied the wrap with a bit more acetone and gave it another 5 minutes. At that point, I was able to gently push the majority of the remaining gel off of the nail. The last image (3) in the collage shows the nail at this point. You can see that there are still some pieces of the base gel stuck to the nail. The white spots are not damage to the nail - that's the base gel that didn't completely release after the additional 5 minutes. I was able to remove those and the few remaining color pieces by soaking for a few more minutes still. So, final thoughts on removal - the total soaking time was 20 minutes for the hand with the No Sanding Base. I feel it is necessary to note that this is likely NOT an accurate representation of the removal time. The base coat is designed to bond to a smooth nail. Since I recently tested another brand that does require buffing (or sanding), my nails are not perfectly smooth. The result is a stronger bond than was necessary. But even so, 20 minutes isn't bad for a removal time! I've had nightmare soak offs that took nearly an hour with another brand that I tried, so overall I'm pleased with a 20 minute removal after two weeks of wear. On the other hand that had the one week manicure without the No Sanding Base, the first part of the removal was similar. The gel seemed to soak off in layers. However, I didn't have the issue with pieces remaining stuck to the nail after 15 minutes. It soaked off clean. This further convinces me that the leftover bits were a result of applying the No Sanding Base to a nail that had been previously sanded. I had a lightbulb moment the other night and decided to revisit the Unity Gel removal. I tend to apply my layers thinner than most people, which is why I always swatch three layers instead of two. My three coats is usually equal to other people's 2 coats. It has never been a problem before, but it occurred to me that my soak off issues with one step gels might be related to the thinness of my layers. It stands to reason that applying the first layer too thin would prevent the gel from removing in a sheet. I'm not sure why it makes sense, but I decided to put it to the test anyway. In the photo below, I applied a thicker first layer (not extremely thick, but thicker than my usual first coat). The result was what most people would call normal application. So, did this change soak off? Yes! It absolutely did change the way the gel removes! In the photo below, I soaked for 15 minutes without breaking the seal (I forgot). The first picture (left) is what the nail looked like immediately after removing the wrap without having touched the gel. The second is after pushing off the remaining bits with the thumb nail of my other hand and adding a touch of cuticle oil. As you can see, soak off is not dissimilar to three step gels. Whoo Hoo! 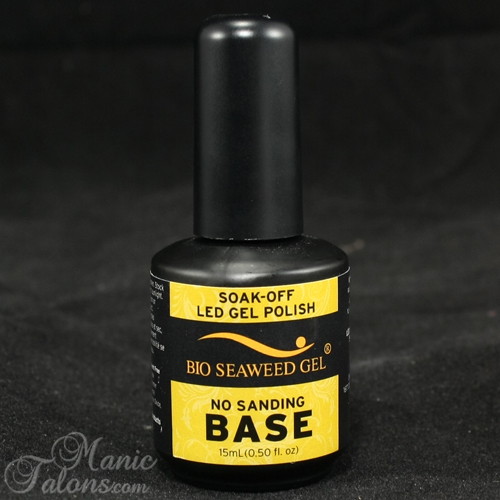 A+ for Bio Seaweed Unity Gel removal. Big fat F for me for not realizing this sooner. The color I chose is a gorgeous, bright, blue toned green cream called Granny Smith. It is opaque in two coats and gave me no trouble with pooling or shrinking. I like to evaluate brands on a scale of 1-5 based based on application, wear and removal. Since I have a few different products with different scenarios going on in this review, I thought I would summarize them for you and rate each one. Overall: I will be using this one a good bit and will likely order more. 5 Stars! Removal: I can't report as I'm still wearing it. I usually go 3-4 weeks on pedicures. Overall, I do like the brand. The removal of the Unity Gel trips me up a bit because it is different than what I'm used to, but it's not horrible by any means. Will I buy more? I will definitely buy more of the No Sanding Base Gel. The top coat is less likely since I can buy a top coat with greater shine in the US without the higher shipping charges, but it is really nice over stamping so I may change my mind. As for the Unity Gels, I probably won't order a color on it's own because of the high shipping, but when I order more No Sanding Base I might throw a few in to make the shipping worth while. ;) If they ever decide to get a US distributor, I would certainly buy more! One other thing I would like to note - their customer service is FABULOUS! I had several questions before starting this review, and the customer service rep I was working with was extremely kind and quick to respond. 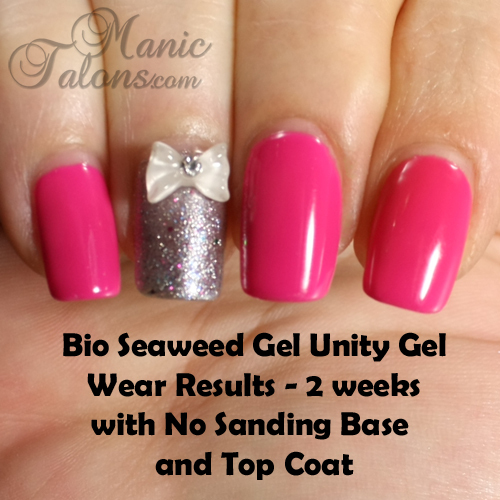 If you would like to learn more about Bio Seaweed Gel, feel free to check out their website here. They also do a lot of giveaways on social media, so be sure to follow them on Facebook, Instagram and Twitter for a chance to win a few samples for yourself! 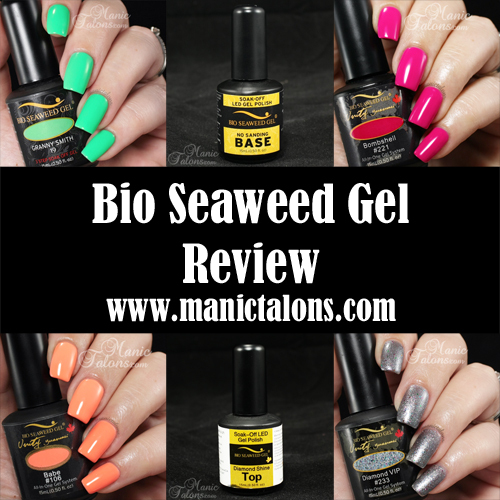 *The Bio Seaweed Gel Polishes featured in this review were purchased from Bio Seaweed Gel using a gift card that I won via one of their social media contests. All comments and observations in this review are my own, unbiased opinions. What a great review, Michelle! You did a great job, and even though I don't do gel, I enjoyed reading this review. BTW, that Granny Smith color is fabbbbbb! Great review! The removal has me a little leary, but the top coat is a great idea b/c I also get "skips" in my top coat when I stamp. Something to consider for sure. Update: So BSG sent notice of a sale + free shipping. I jumped on it. They sent 1 wrong item, so I called their customer service....no answer for 4 days now. I e-mailed their "respond within 24 hours" (Ha!) department. Again, no response. Am going to take it up with PayPal. Maybe they have great customer service for a pro blogger, but they don't seem to have the time for little ol' me. Maybe the sale overwhelmed them? Did you really call it sanding?! It's filing!! I think you had better results with the removal of the thicker coats of gel polish because you removed it (soaked off) right away.